The clear leader in the field of private jets is Lear. William P. Lear began to market his innovative, eight-seat Learjet in 1964. It was built specifically to duplicate all that was good, in performance and amenities, about commercial air travel and offer it to businesses. In 1990, Bombardier Aerospace purchased Learjet, and the planes are now called the "Bombardier Learjet Family." They offer a wide range aircraft. Boeing Business Jets are converted 737 jetliners. They are often fitted out much like a flying home with a master bedroom, large bath with shower, kitchen, living area and a conference room. They are produced via a partnership between Boeing and General Electric. Airbus, located in France, produces about half of the world’s jetliners. The model A319CJ is commonly known as the Airbus Corporate Jet. It is essentially the commercial A319 with extra fuel tanks. The extra fuel increases the range, and by using an existing model design it has a high resale value. Maximum seating is 39 passengers, but the interior can be custom designed for various uses. 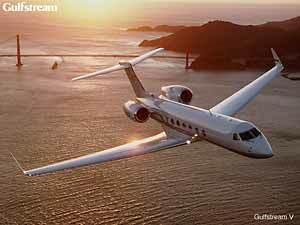 Gulfstream produces a family of private aircraft. Their products are often used in military applications and by governments. Cessna also builds a range of corporate jets in the Citation Series. They were the small aircraft leaders in the 1950s and 1960s. Hawker Beechcraft suffered a serious financial crisis in 2008, but many of their aircraft are in use. Dassault is a French company which builds the Falcon series. It is partially owned by the French government. A recent entrant into the production of corporate jets is the Brazilian company, Embraer. They make several models in various sizes and have a backlog of orders to the Asian market.